Sometimes we cut companies slack, because we know that a figure can't live up to all our expectations. But in the case of Larfleeze, it just seems right to list our every demand. Larfleeze was already a greedy and maniacal thief when he discovered the Orange Light of Avarice. As its sole keeper, the lone Orange Lantern uses his power to build an army of constructs based on the beings he's killed. The gluttonous and darkly comedic Larfleeze is a super hoarder, stealing and collecting anything he can get his grubby claws on. Truly insatiable, he cares only for his own wants and would never share with anyone. We'll say this right at the outset: if you're going to be comparing Mattel's Larfleeze to DC Direct's Larfleeze (as anyone who's bought hem both is sure to do), it's going to be a very tough hill for Mattel to climb - we can tell that even without opening the box. How can we make such a bold claim without any more information than a MOC collector would have access to? Because DCD gave us Glomulus, and Mattel didn't Simple as that. That's a big point against Matty, right at the outset. And things don't immediately start looking up from there. Larfleeze uses many parts from the DCUC "Skinny Male" body, which itself is a fine choice: he's a scrawny character, so that suits him. He also uses Abin Sur's forearms for the appropriate banded look. The shins (I believe) are new pieces, shorter than the usual Skinny Male ones. The hands, torso and upper arms are definitely new: his sleeves are sculpted, and he has raised circles on his shoulders with his Orange Lantern symbol painted in the center; there's another raised circle in the center of his chest, and a distinct collar. So what's the problem? Well, despite the new upper arms, the arms overall aren't any longer than usual, so he doesn't have the inhuman proportions the DCD one boasted. 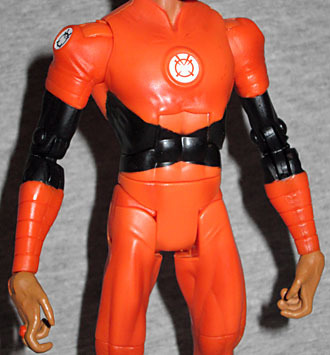 Secondly, a longstanding feature of his costume is that the edges of the Orange Lantern symbol extend out from the center of his chest and become raised seams on his costume; even though this figure gets a newly molded chest, he doesn't get those seams; consequently, he looks undetailed. Incomplete. And then there's the articulation. Most of it is good. He has hinged ankles, hinged knees, swivel thighs, H-hips, swivel waist, hinged torso, swivel/hinged wrists, double-hinged elbows, swivel/hinge shoulders, and a balljointed head. Read that again and see if you notice anything missing. Did you catch it? Biceps. He has no biceps joints. He has a sculpted sleeve where a joint could go, but no actual joint. Even the DCD version had biceps! It's the reason he could protectively huge his lantern battery. This one's arms angle in, which is good, but it would be better if we could choose for ourselves which way they pointed. Plus, his knees are really rubbery - the plastic stretches when you bend them back, and bunches when you straighten them out. That's a recipe for a torn joint if you're not careful. The paint, at least, is good. His Orange Lantern symbols are all painted crisply, and there's dark airbrushing on the orange parts of his uniform to create shadows. His skin or fur or whatever is a nice shade of brown: his teeth and tusks are lighter tan, and his gums closer to orange. His eyes have two tones of orange, so they don't look flat. Rather than coming with the same Orange Lantern Battery that Orange Lantern Lex Luthor came with, Larfleeze gets one of the normal GL batteries, done in orange. All right then. Whatever our problems with the actual figure, the Mike Thompson-created portrait on the back of the box is as good as ever. Larfleeze is floating in place, cradling his lantern and surrounded by a soft orange glow. Usually in the comics he's depicted with energy trailing off him like flames, and the same is true here: it's mainly on his arms, but also the back of his head and his power battery as well. 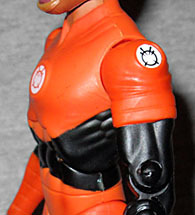 The Orange Lantern symbol on his shoulder is glowing, and there appears to be a light behind the symbol on his chest. Because of the way Larfleeze is written, he's a fan-favorite; and because fans like him, he's often drawn looking somewhat cute; but this painting reminds us that he really is a sinister, threatening character, not someone cute and cuddly. He doesn't get a facelift just because you like him. Larfleeze has a lot of good stuff going for him (the paint, the new sculpts) but too much going against him (the missing articulation, the missing sculptural elements, the missing Glomulus). 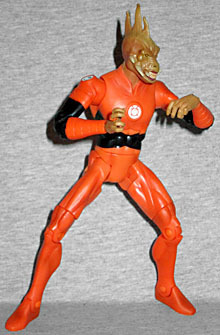 It's tough to say about a figure that didn't have a waist, but DC Direct Larfleeze is a better choice.